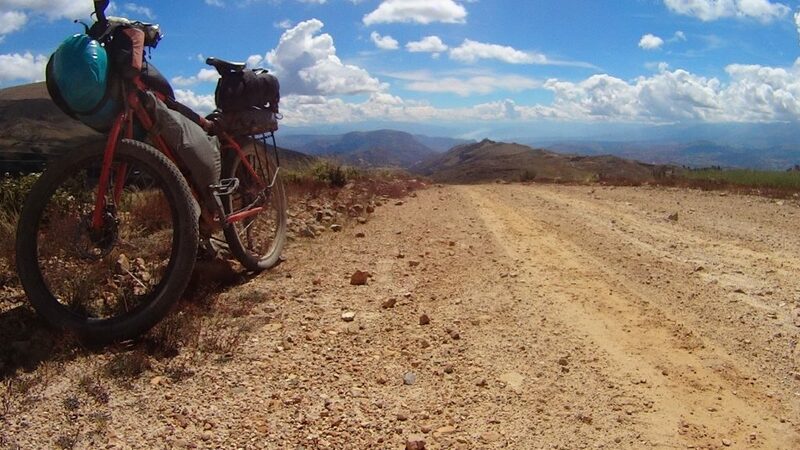 After reading about Paul’s experience on his route between Cajamarca and Cajabamba (he and his friend were detained by mistrusting villagers for 18 hours in Santa Rosa) it was with some doubt that cycling the dirt road via Jesus was a good idea. 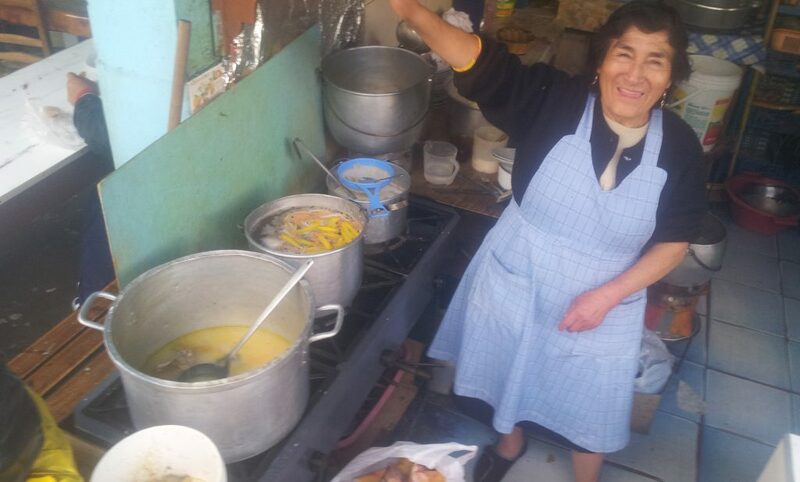 However I had the good will of the ‘teniente’ in Cachachi and I could contact him should any similar events occur (organised by my host Vicki of Casa Mirita in Cajamarca (where I managed to unexpectedly clock up a week of unnecessary rest)). Just after the town of Jesus. 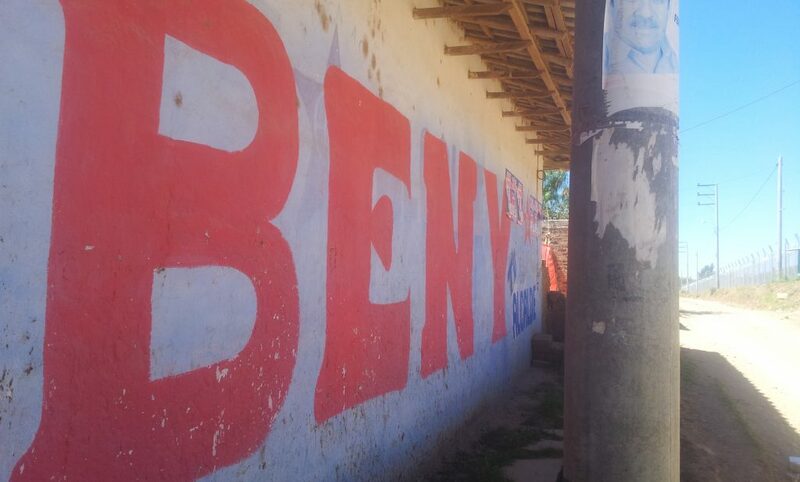 Proudly supporting Beny (possibly some ex-presidential candidate? ); a common sight across the campesinos. Through choice or bribery? Queso Suizo. This one bought in Cajamarca. Often it tastes like rubber and is sold by someone sitting on the floor in the market near a couple of large cow’s heads that seem to stare right at you. This one tasted OK and was bought in an actual cheese shop, mixed with tomate de arbol fruit marmalade kindly donated to me from Vicki at Casa Mirita in Cajamarca. 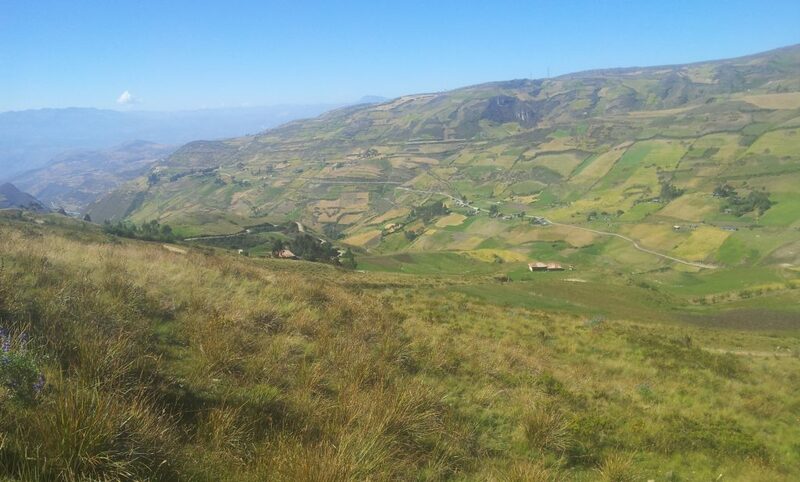 After a long climb to the first pass darkness was descending; I crossed the paramo starting looking for places to camp. Feeling picky, I made the mistake of bypassing most of the options. On starting to descend, the scene for the next half an hour was set with an (un)welcome committee of highly aggressive barking dogs at the first house I passed. The man of the house came out. “Is there an abandoned house or field I could camp in round here?”. “No, there’s nothing”, came the quick retort that completely contradicted the reality. Fields and ruins were abundant. “OK, thanks. Maybe there’s someone kind[er] below.” There wasn’t. I cycled down with darkness approaching. The next inhabited house fielded a similar response. “Ask the ronderos.” “Where are they?”. [Waves vaguely in the direction of a massive expansive of valleys and mountains]. Side note: for those unfamiliar, the ronderos are vigilantes from the villagers that roam the surroundings making sure there’s nothing happening that shouldn’t be. An invention that came about due to insufficient (zero?) police support. I’m told they carry around whips made out of the penises of bulls which cause some considerable pain and are used to punish people breaking village law (eg. see here). The dirt road continued to wind its way down the steep valley. I saw a group on the below switchback. Ronderos perhaps? Maybe they could help me find somewhere to camp. I quickly rounded the corner and headed towards them. On seeing me, they immediately starting running away straight up hill through the vegetation! A first in 30000km of bicycle travel. It became apparent that these people were unusually scared and mistrusting of outsiders. A couple of other encounters with nervous locals of a similar nature had me frantically accelerating downhill in a hopeful attempt to find somewhere before dark. And as is so often the case I found somewhere suitable at the very last minute. I was absolutely delighted to be offered floor space in the classroom of a local school that had a big locked blue metal door and running water. The next morning. Taken shortly after cresting the second pass. The village made famous through Paul’s escapades comes into view, Santa Rosa. “DUENDES! !” (spirits?) shouted the man huddled protecting his family as I descended towards Santa Rosa, the village where Paul and his friend were placed under village (mob) arrest. I was half expecting an entire village to surround / ridicule me and repeatedly rummage through my belongings to check for ‘terrorist’ activity. I was almost disappointed; passing through Santa Rosa turned out to be rather uneventful. There was nearly no one there except one man who I assume was the rondero (maybe they had locked themselves fearfully in their houses). I continued on. 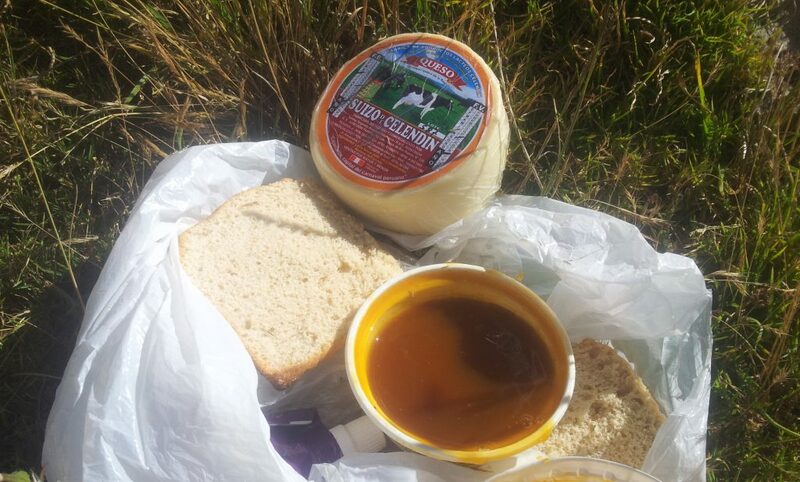 In Cachachi, 10 kms down the road I stopped for a snack. One woman was particularly nervous of me and I saw her walking from woman to woman gossiping and looking back at me with a look of fear and mistrust. Something had clearly happened here with gringos. 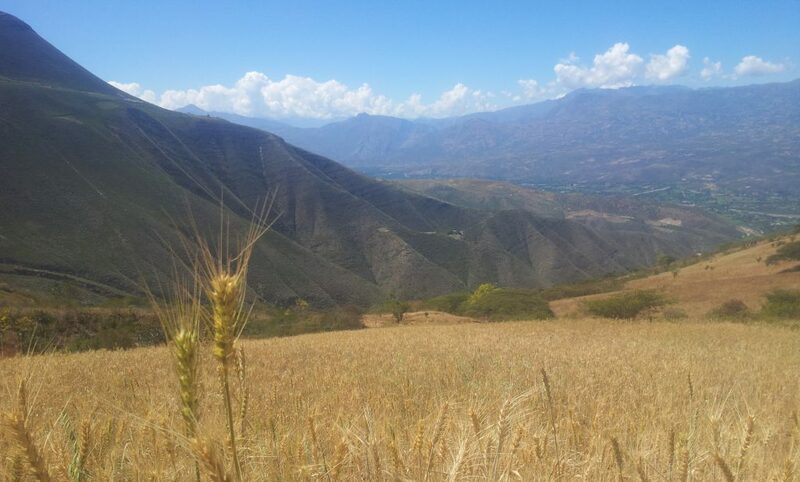 I took the high road after Cachachi and, after it topped out, a fast and long dirt road descent ensued passing some rather attractive looking wheat fields. 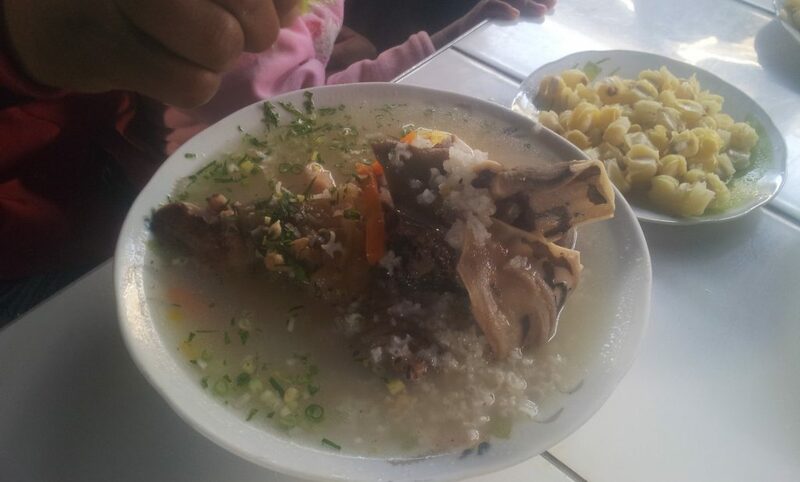 Caldo de gallina (soup of hen) in Cajabamba. Allegedly the hen is free range although I expect this to be a rather loose description judging by its low price and immense popularity in Peru. It’s normally pretty tasty and seems to be (relatively) healthy. So far I’ve not (knowingly) been sick from it and it seems like a pretty good food option. Especially if you’re already suffering from some kind of ongoing digestive problem (not uncommon in these parts). $1.50 to $2.50. Further chats with a vigilante in Cajabamba revealed that in the 80’s there had indeed been problems with gringos. With his strong local accent it was hard to get the full details but my best translation attempt is this: there was an armed gringo with (or without) a group of fellow terrorists and they were involved in, well, terrorist activity and people (possibly police) were killed in the area. Strange huh? 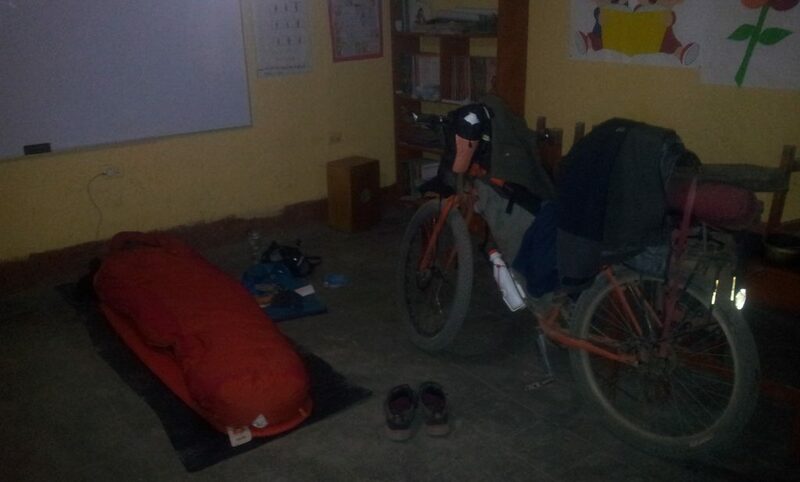 So a gringo cycling through villages in remote Peruvian villages (i.e. me) is surprisingly suspicious. I should note that I have spoken to other cyclists have also since passed through here without event. I guess their massive over-reaction with Paul may have embarrassed them into changing their outlook. And then into the market of Huamachuco. 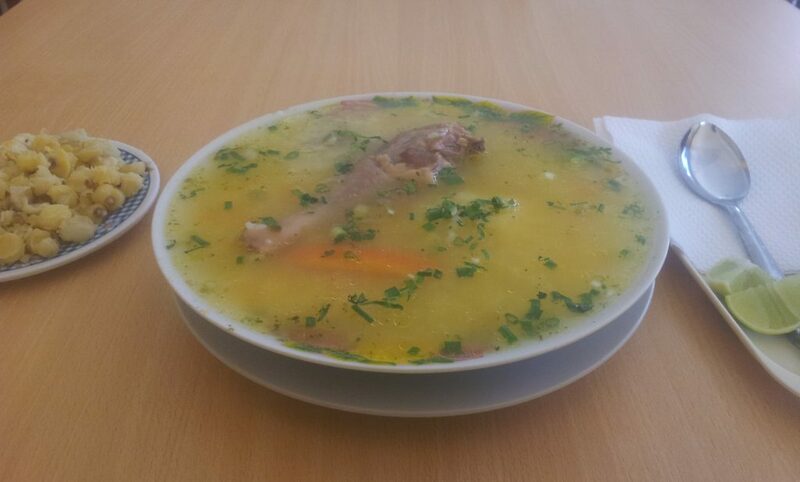 Caldo de Cabeza (head soup). This seems to be a caldo of equal popularity. Different parts of a sheep’s head. Yes, I sympathise, I’m hesitant to try it too. 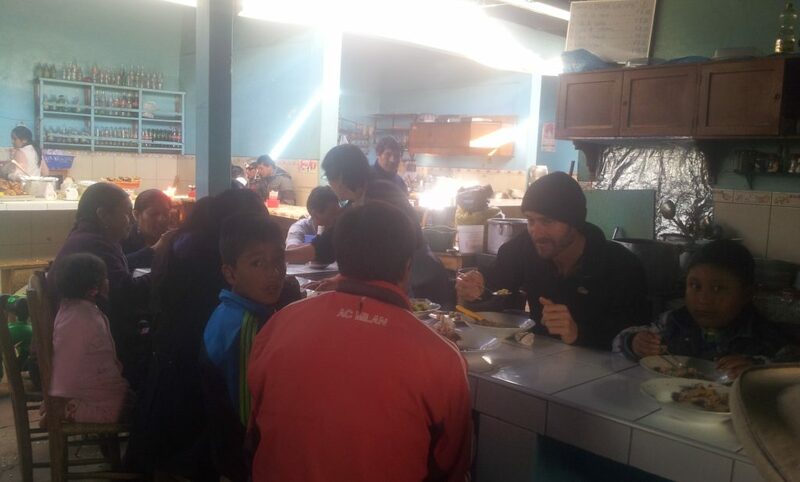 Fraternising with the locals over breakfast in Huamachuco market. Forget about a quiet meal alone, wherever you go you will be talked to. 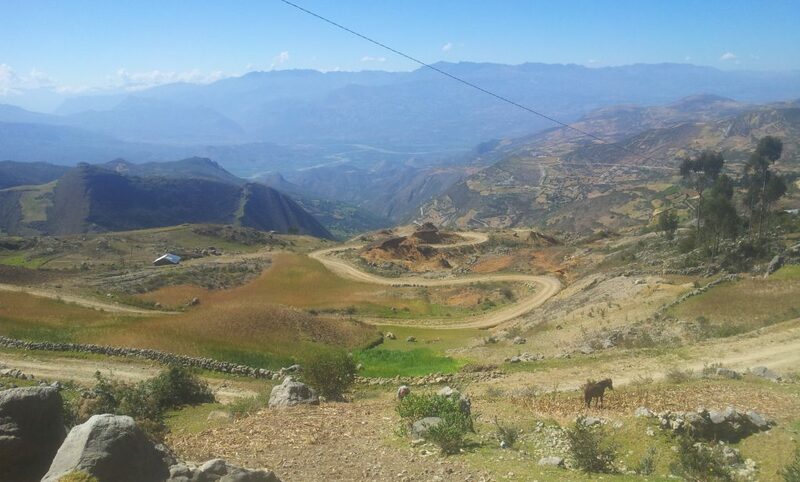 There are two options out of Huamachuco, I headed straight south out of town and the usual daily Peruvian 1000m climb began in ernest. There is a rewarding scenic lake (laguna Huayquillas) at the top. Then it continued to roller coaster up and down. Funny how those tiny blips on the gpx elevation profile are actually 200m or 300m climbs which quite quickly add up to more than the 1000m unbroken climbs that you’ve prepared for. Heading down the loose rocky terrain from the first pass, I stopped to ask a fearful local woman if I could camp by the side of the road (near her home). “No, because the Guasca will eat you”. Making up ridiculous stories, it was clear she didn’t want me there. I continued down eventually finding a place hidden amongst some trees. From the top of the third pass, this horrific abomination came into view. 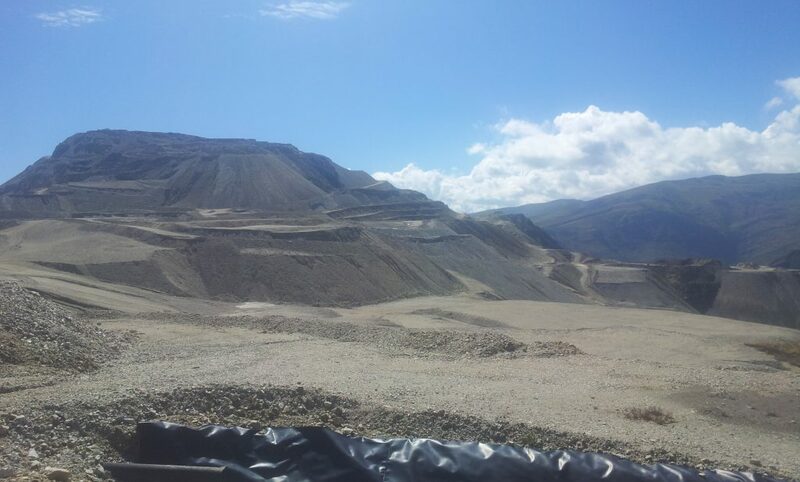 I had finally lost my Peruvian mine virginity and I didn’t enjoy it. “I mean REALLY? They actually did that?” I remember thinking. Then my thoughts turned to the task at hand and it dawned on me that I was going to have to cycle through the damn thing. My other options looked bleak. 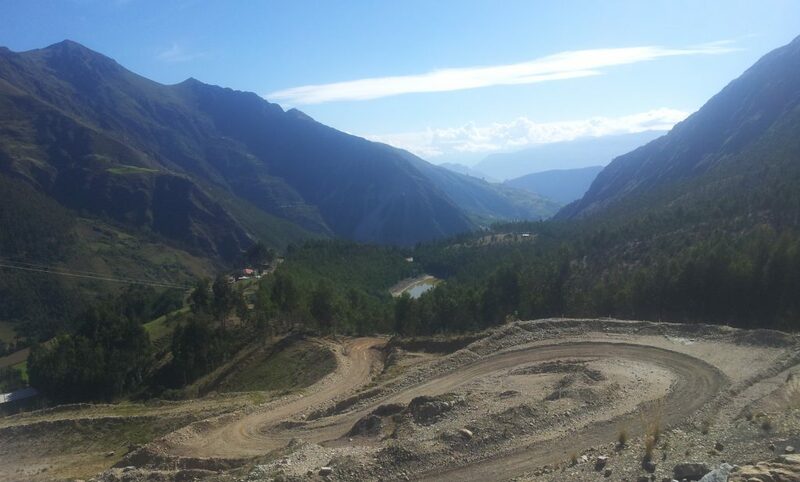 The route back up was steep and rocky and the other alternative would have added another couple of days of cycling. 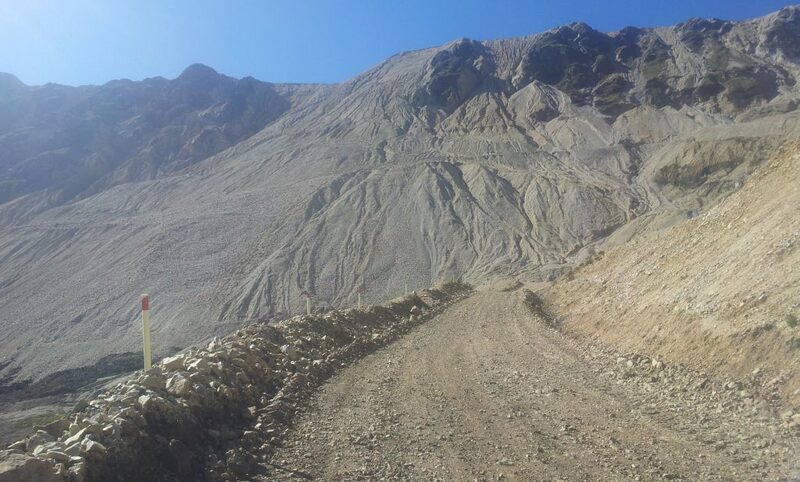 The route down to the mine was like this. Rarely travelled (understandably). You can just see the security guard on the left rushing to tell me that taking photos was not allowed. “What do they mine here?”. “Si, si”, pretending not to understand. “Copper, silver” he said. “Gold?”, I probed. “Si” he admitted, for some reason embarrassed by the fact? I had expected there to be lots of activity with trucks but it was empty. 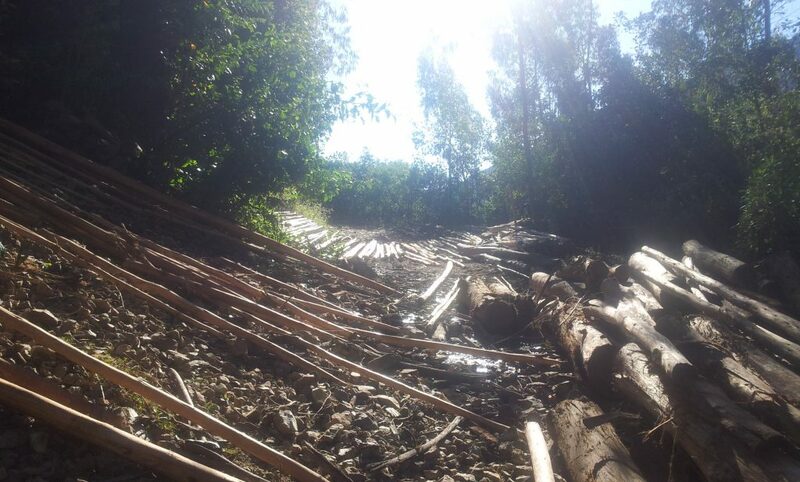 I think the part I passed through had already been raped and they were busy opening up (destroying) another section. Onwards I forged passing through a cluster of houses at the base of the monster. …; quite tedious since I needed to rest. On passing her neighbour, I could hear the repeated shouts: “tell him, ‘MONEY!!’”. Thankfully the neighbour was more respectful (or perhaps just too lethargic). I continued on hungry, tired and hot up the steep dirt wondering whether they had been accustomed to gringos from the mine handing out cash. Her request was probably somewhat understandable; in her mind I was a gringo and likely involved in the destruction of her once very scenic view. Therefore she deserved compensation right? And since it’s all part of the capitalist society that I’ve benefited from, maybe it’s fair that she ask. I continued up with a sense of guilt. The road eventually met Jo Cruz’s route (the other alternate route out of Huamachuco which I imagine would be a better option (unless you’re intrigued by cycling through enormous amounts of gravel)), and descended down another rough rocky road across an open plain and into a cool hidden valley. Back into the open, another enormous mine could be seen on the adjacent mountain (this one bigger) but there was no need to pass through it this time. The road became very overgrown and disjointed in a couple of parts as it descended down into a deserted valley where I camped in solitude. Very cool. After Mollebamba there was an interesting singletrack option passing by casitas down to Mollepata which is detailed on bikepacking.com. I discovered it actually continues all the way down to the canyon river. Steep in parts it provided a shortcut through the switchbacks and was nearly all rideable on a mountain bike. (The very last bit was a little too steep). Nor did Joe Cruz’s route which continued down this canyon. My actual route didn’t follow this either though and veered off up a different canyon towards Conchucos and the east side of the Cordillera Blanca. 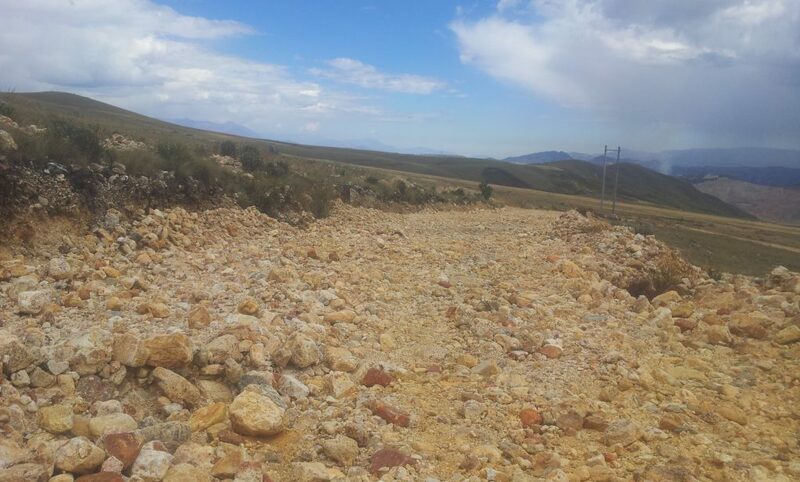 TIPS: Avoid the route via Laguna Pelagatos, two cyclists were robbed coming down from Ongos. 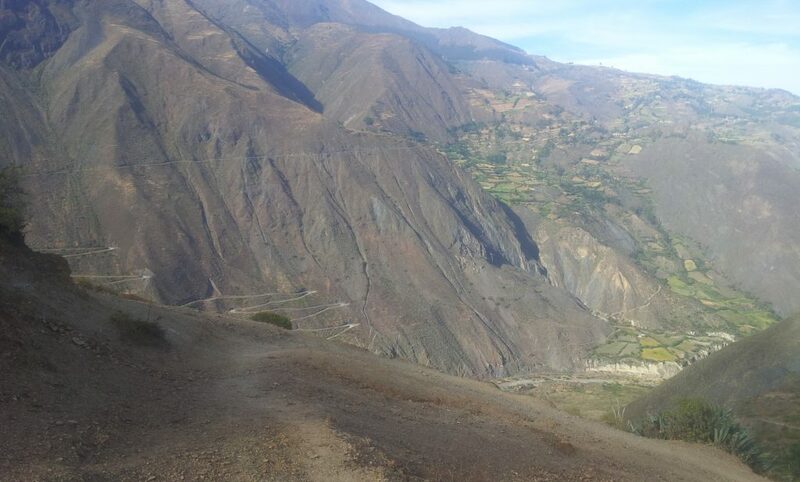 A local in Conchucos confirmed it to be dangerous; drug gangs are known to operate in this area (or something). He mentioned some these as places to avoid: Pushakilka, Pampa El Condora, Mongon Nauchabana. Next up: approaching the Cordillera Blanca down the east side. Looking forward to the Cordillera Blanca. Great stuff Nick. 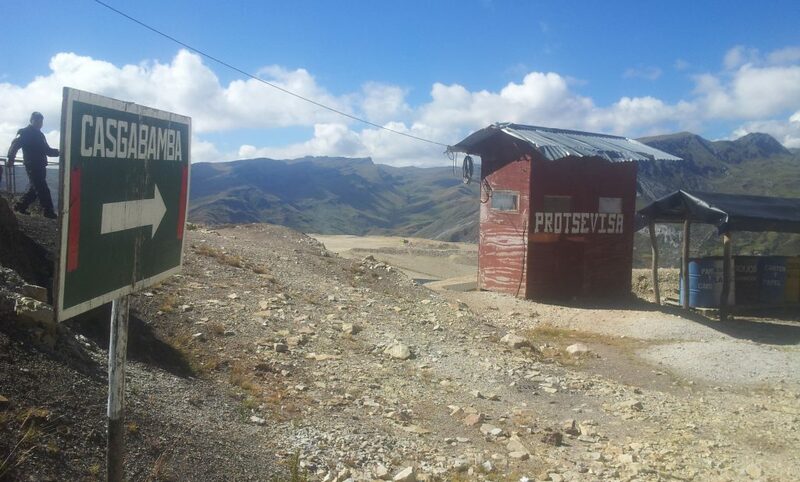 Great photos Nick, interesting experience with the mine for sure. Safe travels. We haven’t met but it looks like we took a very similar route South from Casa Mirita (I was there a few weeks after you) – that mine was indeed an abomination and bloody steep in places!! Where have you got to? 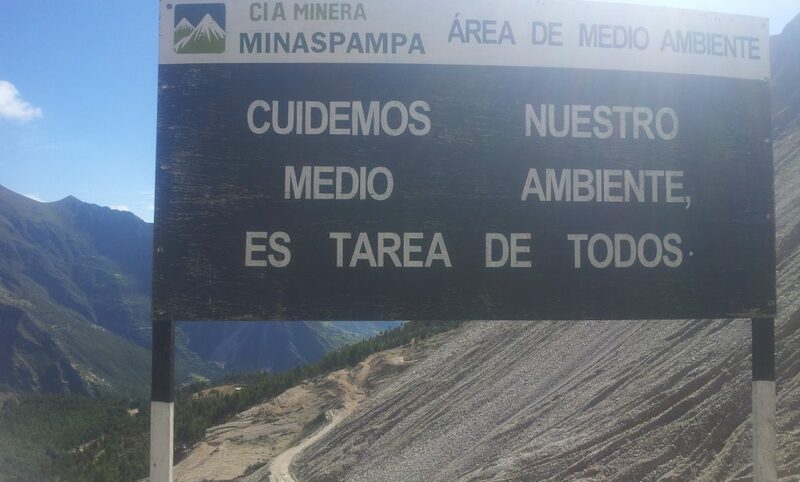 I imagine you must be in or nearly in Bolivia by now? 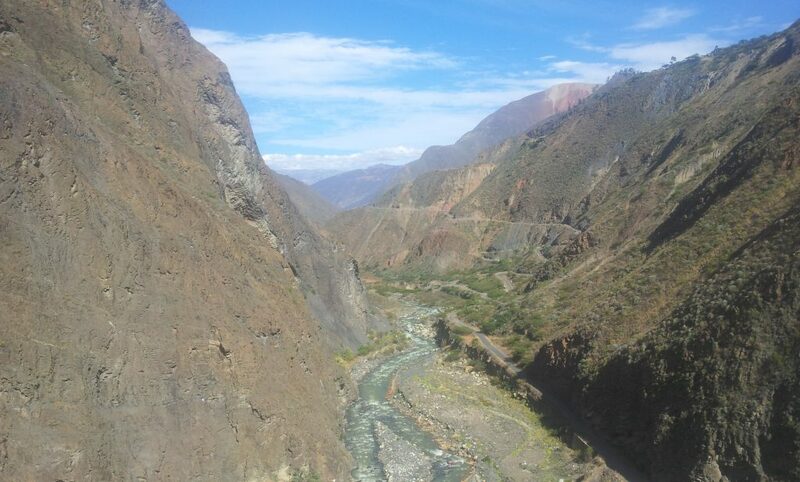 I’m nearing Abancay and heading direct to Titicaca. Might perhaps bump into one another at some point! Good stuff – enjoy the 2nd part! I hope you re-acclimatise quickly and the weather holds for you! Hi Brian, that sort of behaviour sounds very familiar! 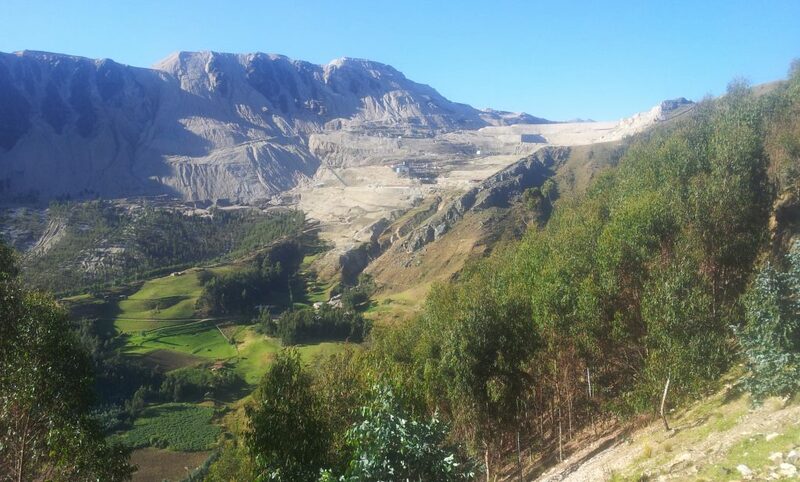 I’m in Huancavelica today. This afternoon a woman stopped me in the street and proceeded to ask all the normal dull direct and personal questions about where I was going, where I’d been etc. She then started muttering something about gringos on motorbikes stealing bodily organs! She mentioned a name which I think is their equivalent of the boogeyman (I heard this name in another town too). At this point I walked off.